Paul Pierce is a staple in the postseason and has been his whole career, but he's also a master troll and he's showing that off following a series sweep of the Toronto Raptors. For the second straight year, Pierce has been a part of the Raptors demise in the postseason, as he lead his Nets over the Raptors last year and has bested his 2013-14 run by sweeping Toronto with the Washington Wizards. But it's not enough for Pierce to simply win a series, he needs to let you know he won. 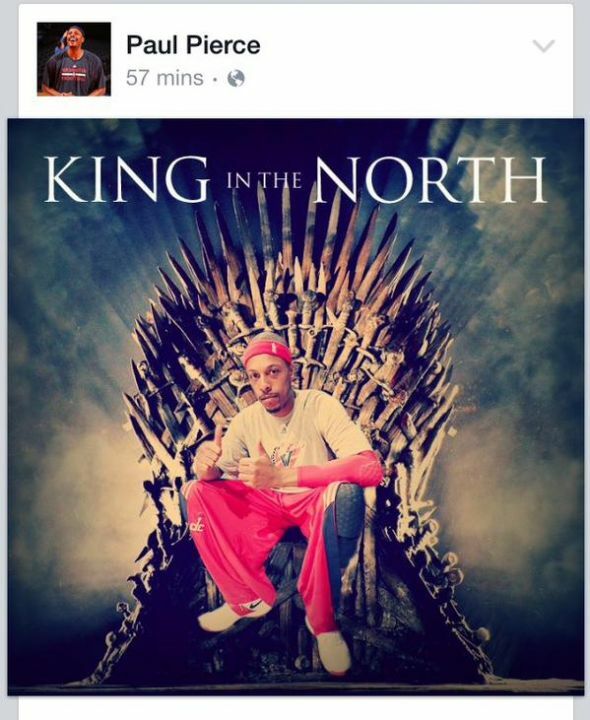 In wake of the series sweep of the Toronto Raptors, Paul Pierce is continuing to keep his troll game strong and rolled out another burn following his epic Game of Thrones mic drop moment on Facebook. This time, he went after Raptors super-fan Drake and it was classic Paul Pierce trolling. This was all started by Paul Pierce before the series and he's very clearly finishing it now that the Raptors are four games and done in the postseason. Last year Pierce trash talked the Raptors through a first-round victory with the Brooklyn Nets, and that was something he continued this year. All of this came after he trolled the Raptors for claiming to be the team of the north, but exclaiming he is the King of the North - which is a sick burn. Paul Pierce may not be in the playoffs long enough to make an NBA Finals run this season, as the Wizards won't matchup well against the Bulls or Cavaliers in the Conference Finals. But for as long as he's in the playoffs, he's going to keep his pimp hand strong and his troll game even stronger. Washington Redskins relocating to Virginia?